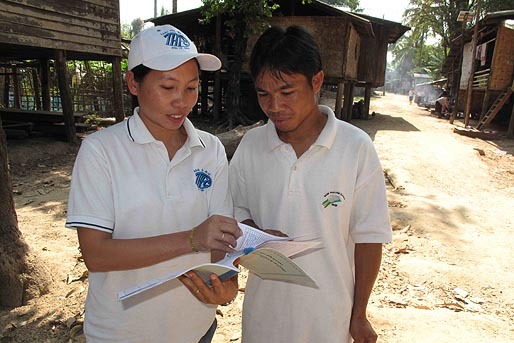 Health monitoring for all people in resettlement villages. Under the Expansion Project, five clinics have now been completed and two are under construction. THPC works closely with the local authorities to ensure that the new clinics are accompanied by improved skills, systems and attitudes so that health services can continue to develop in the long run. Parts of the health program are successively handed over to the district services as part of a gradual process to guarantee local ownership. Mother-and-Child outreach services provided under the program now cover over 100 villages, bringing pre- and post-natal checks for mothers and babies, growth monitoring for children, health education, and immunization. To help villagers get full value from their new water supply and toilets, a community program on hygiene and nutrition practices is underway. To give people a better understanding of how their most common health problems can be prevented, community educators hold discussions and demonstrations on the links between behaviour and illness, offering home-based solutions. For example, the team organises cooking classes for mothers of young children, showing women how to combine locally available ingredients to provide a more varied, protein and vitamin rich diet to their families. The importance of latrine use, hand washing and clean utensils is also emphasised. THPC has health monitors in each village so that knowledge of each community's special needs is available. Vulnerable families and individuals with special health problems have been identified in each village and their welfare is closely monitored. Individual solutions to their challenges are sometimes possible, using the resources of the various SED teams.